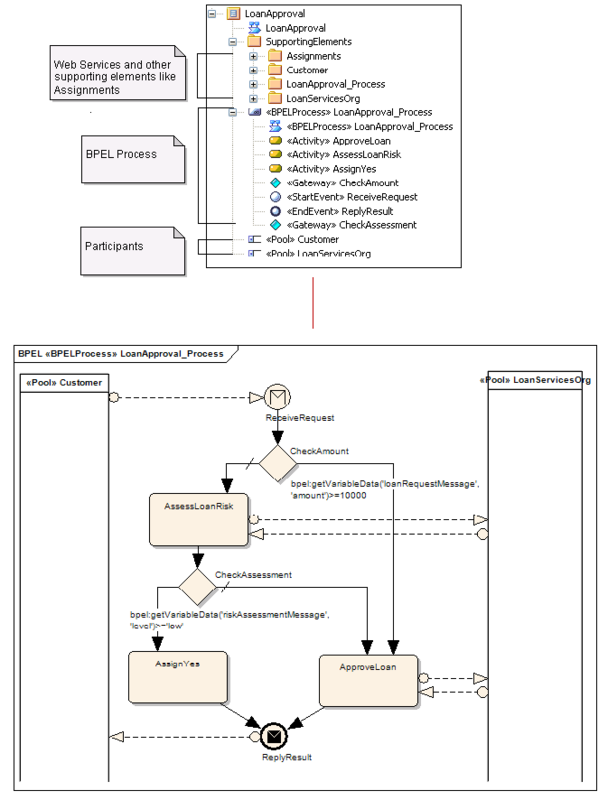 A BPEL 1.1 model consists of a BPEL Process (containing a BPEL diagram and mappable BPMN 1.1 constructs) and other supporting elements (like BPMN 1.1 Assignment, BPMN 1.1 Web Service) required for generating BPEL 1.1 code. A sample BPEL 1.1 Package structure can be created in the Project Browser, using the 'Select Model(s) (Model Wizard)' dialog. You can use this Package structure as a template for developing your BPEL Process. Select the root node or a Package in the Project Browser. Click on the 'New Model from Pattern' drop-down menu option in the Project Browser header. Select the value BPMN 1.1 i n the Technology section. Check the option 'BPEL 1.1 Model' in the 'Name' section. Click on the OK button to create the sample BPEL 1.1 Package structure. The BPEL Process LoanApproval_Process acts as container for the BPEL diagram and elements. The SupportingElements Package contains supporting components like Assignments and Web Services.